This 10-minute film serves as a brief overview of Johnny's Selected Seeds. It includes a discussion of corporate philosophy, customer service, plant breeding, company history, employee ownership, product development, marketing, and international sales. The video features several short interviews with Johnny's Chairman and Founder Rob Johnston, Jr. and Eliot Coleman, along with a few Johnny's customers and employees. 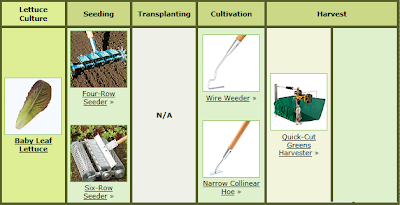 Did you know we have a chart that allows you to select tools expressly designed for specific lettuce production practices? Gain efficiency and optimal results in lettuce culture, from sowing to harvest. One person can easily cut over 175 lb. per hour. Powered by a cordless drill, the harvester's 15" fixed and moving serrated blades make a smooth, clean cut. A rolling macramé brush pulls individual leaves into the blades and then throws them to the back of the basket. The neat, clean surface it leaves behind is perfect for those planning on a second harvest from the same bed. Vertically adjustable skids ensure precise, repeatable cutting height. The harvester is just as effective when the crop is more mature or "leggy." Comes with an extra serpentine belt to power the brush and has a universal mount which will accept almost any cordless drill; 18V drills work best (not included). Here at Johnny's, we are often asked about the return on investment (ROI) for greenhouse crops. Seed for greenhouse varieties is typically priced higher than seed for field-grown varieties, but in this case, we believe you get what you pay for. The breeding and development of protected-culture varieties is much more specialized, and the return should be greater to justify the extra investment required by the breeder as well as the grower. 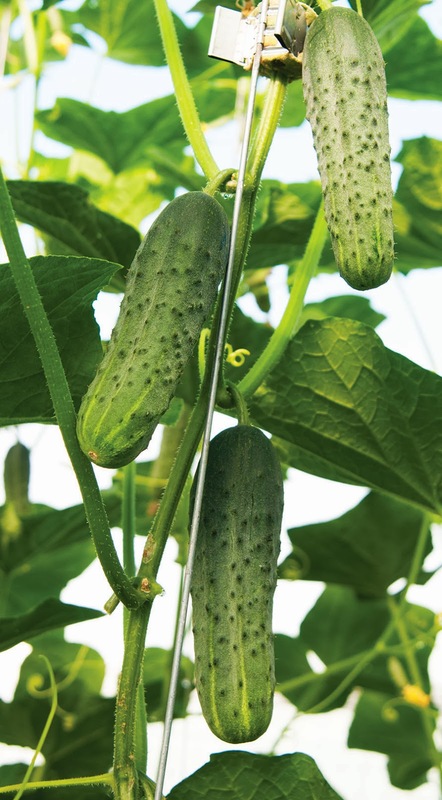 If what you really want to know is, Why so much more money for this greenhouse variety?, Andrew Mefferd, Product Technician for cucumbers here at Johnny’s — and a seasoned greenhouse grower himself — has some answers for you. Bottom line, ROI and profitability will typically be higher for greenhouse cucumbers than field-grown cucumbers. One key reason is because cucumber yields from the greenhouse are higher as a result of the optimized growing environment. In particular, it’s warmer, so plants grow in their optimal temperature range more of the time or even all of the time. If you harvest just one more pound of cucumbers off a greenhouse variety, the seed will have paid for itself, and anything above and beyond that yield is profit. Because you can ask a higher price for greenhouse crops at market, selling even just one extra fruit can sometimes cover the cost of the seed investment. Greenhouse varieties are higher yielding because they are selected for the specific environmental conditions within greenhouses and hoophouses. They are, for example, selected for resistance to diseases that can be problematic in protected culture. This allows them to stay healthier and produce over a longer period of time within that environment. Within the greenhouse environment, plants are provided not just more optimal temperatures but also optimal water through irrigation, instead of relying on rainfall, which can set plants back when there is too much or not enough. Pests can be minimized in the greenhouse with the use of preventive measures such as insect screening and trellising. Ground insects or slugs that might feed on field cucumbers usually won’t crawl up a plant to feed on fruits that are elevated off the ground. When you have fewer plants damaged by pests, you’re left with more marketable crops to sell. It’s important to note that greenhouse varieties often have better flavor because produce from a sickly plant that is inadequately photosynthesizing is just not likely to taste as good as produce from a healthy, greenhouse-grown plant. A greater range of cucumber varieties can be grown indoors than outdoors. These include long, European types and more of the seedless, thin-skinned types. One key reason for this is because they’re protected from bugs indoors, which is especially important for seedless, thin-skinned types, which are more susceptible to pests due to their thin skin. Greenhouse cucumbers are relatively quick to start bearing. Some early varieties can start yielding fruit as early as 45 days after transplant. As noted above, cucumber plants also live much longer in the greenhouse than in the field. A field-grown crop might bear for one month before the plants get tired out, and disease and pests take over, whereas. 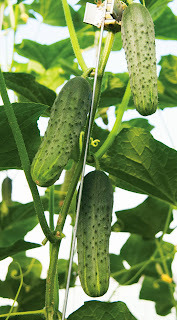 it is more typical for greenhouse cucumber crops to last several months. For greenhouse growers at high latitudes (like those of us here in Maine), it’s important to note that it can be very challenging to grow cucumbers through the winter — but it can be done., They require a lot of heat, and also require supplemental lighting. However, even without lights, your cucumber season can be extended well beyond the beginning and the end of the typical field cucumber season. Lastly, it is important to research which varieties your market wants most. If what your markets demand are slicers or slender, Japanese cucumbers, be sure to grow those, rather than focusing efforts on picklers or the long, European types. Tim researching your market will pay off, when it comes to bottom-line ROI. Leave us a comment — we are interested in your questions and comments about growing greenhouse cucumbers! Orders placed weekdays by 1:30 PM Eastern Time will be shipped the same day. Exceptions include orders of products not currently in stock as well as orders requiring additional import documentation. † Standard shipping rates cover shipping charges only. Duties & Taxes may be assessed and collected upon delivery, and are the responsibility of the recipient. All amounts shown are in US dollars. Refer to the chart at right for standard shipping charges. Brokerage fees may be incurred for orders shipped via the US Postal Service if they are worth $1000 or more. All orders placed online equal to or greater in value than $1000 require that a Customer Service Representative contact the person placing the order, before the order is shipped, to discuss shipping options. 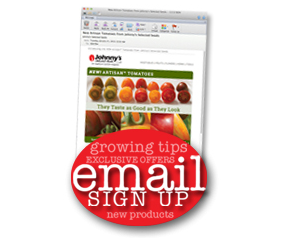 If you have any questions regarding orders worth $1000 or greater, please contact Johnny's toll-free at 1-877-564-6697, or email service@johnnyseeds.com. Burlington, Ontario, CANADA — All-America Selections (AAS) hosted their annual Summer Summit August 12–14 this year in Ontario, Canada. 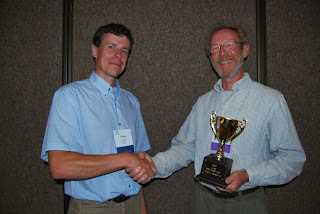 Rob L Johnston, Jr, Founder and Chairman of Johnny's Selected Seeds, was selected by the AAS Board of Directors to receive the 2013 Breeders Cup. The AAS Breeders Cup Award recognizes someone who has had a significant impact in horticulture by breeding stand-out varieties. Rob's contribution to the world of horticulture includes helping produce varieties that in diverse climates have outstanding flavor, disease resistance, and garden performance. 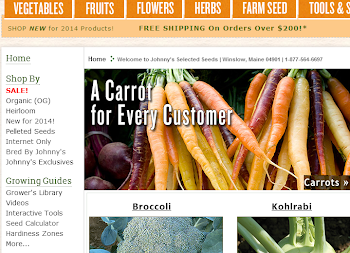 Under Rob's leadership, the Johnny's breeding team has introduced more than 50 varieties. Seven of these Johnny's-bred varieties have been honored with the prestigious All-America Selections award.